Why are some gymnasts able to bounce back after a routine or competition while others have difficulty rebounding from bad performances? Which type of gymnast are you? 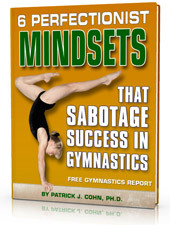 There are two types of mindsets a gymnast can adopt after a less-than-best competition: the “oh-no-remember-the last-time” mindset and the “go-get-it-next-time” mindset. Is characterized by fragile confidence – One bad routine creates overwhelming doubt and causes confidence to nose-dive. Looks for the negative – Bad performances are seen as evidence of a lack of ability or declining skills. Lacks the proper focus – This type of gymnast is focused on the past (ruminating about past mistakes) or the future, fearing bad results in upcoming routines. Is characterized by stable confidence –This type of gymnast believes in their ability to bounce back. Sees the big picture – One bad performance is seen as just that… one bad performance. Looks for the positive – Bad performances are seen as feedback to help improve future performances. Focuses on the present – This type of gymnast is focused on what to do in the present, in both training and competition, that will help them perform at their peak. The University of Utah women’s gymnastics team exemplifies the “go-get-it-next-time” mindset. The Utes lost back-to-back meets against Cal Berkeley and University of Michigan by narrow margins heading into their last meet of the season. The end of the season is the time when you want to be at your best, especially as you gear up for the Pac-12 Championships. With hopes of a national title, Utah co-head coach, Megan Marsden, put the losses into perspective and moved forward with preparations for achieving the team’s ultimate goal, a National Championship. The “go-get-it-next-time” mindset puts you in the best mental state for bouncing back after a bad performance and achieving their objectives for the season. Bouncing back requires a “Go-Get-It-Next-Time” mindset. Focus on what you want to happen. Visualize yourself performing your routine the way you want to perform it. Learn and grow from your previous mistakes and experiences. Avoid self-pity and judgement about not performing to your standards. Think about how you will get back on track instead of avoiding another poor performance. Sometimes it take small adjustments to improve your score in a big way! 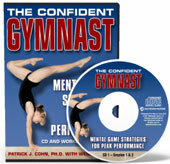 Learn Mental Game Secretes to Unstoppable Confidence in Gymnastics! Are you ready to improve your mental toughness and perform with ultimate self-confidence in competition? Check out The Confident Gymnast Program! The Confident Gymnast CD and workbook program was developed not only by Dr. Cohn, but with the assistance of former gymnast Olympian Wendy Bruce. The Confident Gymnast is ideal for any competitive gymnast. But not only do gymnasts benefit from the program, coaches and parents do as well! 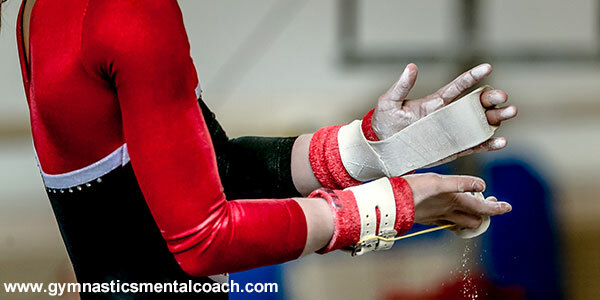 Coaches: Boost your gymnasts’ confidence using simple, proven mental strategies. Parents: Help boost your athletes’ performance. Don’t let their mind hold them back any longer! 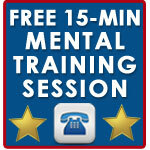 Mental Coaches: Learn a proven system for helping your athletes boost mental toughness. 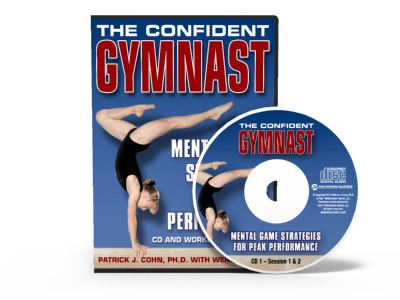 The Confident Gymnast is a complete brain dump of the TOP 8 mental training sessions we teach our gymnasts to help them boost their mental game and improve consistency- from how to mentally prepare for competition to performing under pressure to building unstoppable confidence. What are our mental coaching students and parents saying? Dr. Patrick Cohn is the owner of Peak Performance Sports and has helped athletes improve their mental game for 25 years. He's the author of "The Confident Gymnast" CD and workbook program.